Choose trick over treat with our economy Bloody GHOULISH GREEN Eyeballs! These flexible plastic hollow-back eyeballs feature painted blood vessels and attached flesh, as if they've been ripped out of their sockets. Add them to Halloween party favor bags, Mad Scientist Halloween haunted house scenes or trick-or-treat bags! 5-Life Size TOXIC BIOHAZARD EYES Cut-off souvenir parts from the Zombie apocalypse! Looks so real packaged right from the Mad Scientist Laboratory! Gruesome Grocery Store prop... 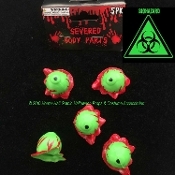 Toxic Biohazard GREEN with Puddles of RED painted Blood! Detailed in Green and Red Multi- Color. These 3-Dimensional RUBBERY PLASTIC Squishy Eyeballs will be watching you! – Eyeball without blood puddle approx. 1-inch (2.5cm) diameter.